ANA Mileage Club is the frequent flyer program for All Nippon Airways, the Japanese carrier that is a member of the Star Alliance. ANA's product is reviewed on this site and ranks as one of the top airlines in the world for international travel. Lucrative reward chart, especially to Japan. Generous routing rules allowing stopovers. Zones based on regions and not mileage. Recent reduction or elimination of surcharges from North America to Japan. Partner chart is not unreasonably more expensive. Allows for upgrades with points. Allows for families to pool points for single ticket/person redemption. Allows for mixed class ticketing. Inexpensive Round the World chart. Can not use for one-way tickets. Zone charts combined with Seasonality charts adds some complexity. Connections with United or Air Canada in North America require more points. Significant surcharges on many flights. Strict rules on who may receive reward ticket, limited to family members. Three "season" fare adjustments are applicable to ANA flights only. The seasons are [L]ow, [R]egular and [H]igh. Additionally the dates for these seasons vary on zone. For example, from North America to Japan in February of 2016 is low season, but a continuation to Sydney Australia is regular season. Fortunately the search engine sorts out these inconsistencies. From/To Japan (Zone 1) - North America (Zone 6). These flights must depart from the North American cities of Los Angeles, San Francisco, Seattle, San Jose, Washington D.C., New York, Chicago, Houston or Vancouver. They can include transfers to other cities within Japan. This chart DOES NOT apply to transfers within North America that may be needed to get to the gateway cities. The points required are shown for round trip tickets, so a round trip in Business Class from Washington D.C. to Tokyo is a very reasonable 85,000 points during the "regular" season. If you want to travel to South Korea on ANA you will fly to Tokyo and take another ANA flight to South Korea. For Economy and Business class this is an additional 5,000 points. As indicated, China, Hong Kong and Taiwan are in Zone 3, Singapore and other Indian Ocean destinations are in Zone 4. In Business Class to Hong Kong it's only another 5,000 points round trip and to Singapore 25,000 points. The only other destination ANA flies to is Sydney, Australia, which is in Zone 10. However be aware at this time that flight leaves from Haneda and you are probably flying into Narita, so a difficult ground transfer is on your agenda. Interestingly enough, it only costs an additional 5,000 points to go "down under". And don't do First Class because the don't fly First Class from Tokyo to Sydney! In this case you can do a mixed class fare with First Class from North America and Business Class from Japan to Australia. 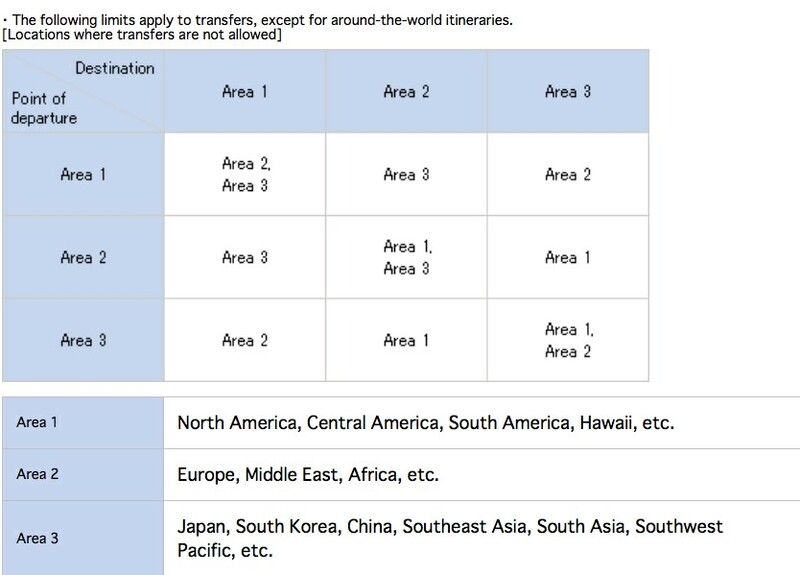 For itineraries to/from Japan that include any partner airline these charts will apply. While it may be confusing the two zones are straightforward. The Seasonal aspect does not apply to Partner flights. Zone 1A: This chart applies when there is a single international flight into/out of Japan. It can be one flight is ANA and the other is on a partner like United or both on United. If both are on ANA without North American connections then the ANA chart applies. In addition a maximum of 2 transfers on each side are allowed inside of Japan. Zone 1B: This chart applies when there are 2 or more international flights on one side and/or include transfers outside of Japan. 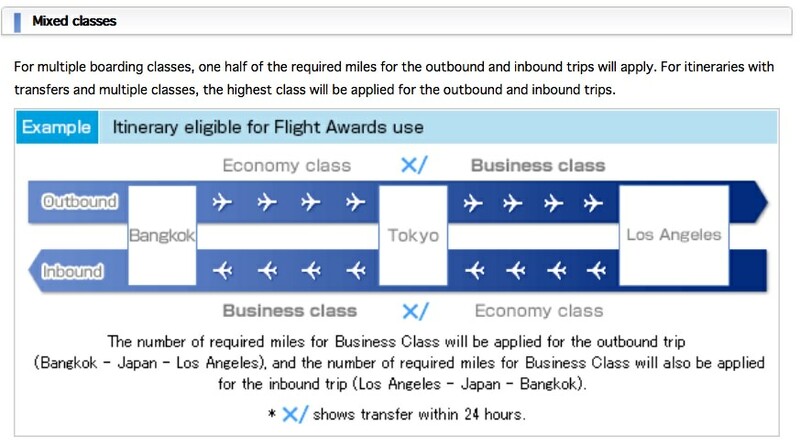 So a San Diego to Los Angeles connection for an international ANA flight to Tokyo would be Zone 1B on the Partner chart. For any transfer inside North America on United or Air Canada, the required points to Japan equals the high season rates on the ANA chart. For Economy and Business they are only 5,000 points more that the ANA chart, which is reasonable for the connection. For reference here are the other charts from destinations outside North America. Other than Star Alliance carriers ANA has a few partners you can book reward tickets with. The only exception is that the full itinerary must be on the partner airline. In addition to the points required to secure a reward ticket, government taxes and carrier imposed fees starting from $70 per ticket is charged. Reward tickets from ANA Mileage Club require paying any surcharges issued by the carrier. Recently in 2015/2016 ANA reduced or eliminated these charges on flights from North America to Japan. If you are connecting on to another city the surcharges apply. Surcharges are in addition to normal taxes and fees. Fees vary by airport. For example European cities like London have significant fees applicable to any ticket, paid or reward. This example shows a flight from Los Angeles to Singapore with a YQ fee of $407 that is passed on. However if this trip was taken on a Partner Airline with no fees, the cost is 31,000 points more! At 2.5 cents a point that is $775.00, so the $407 is a bargain. Using ANA's website to make and change any itinerary is at no cost. If you need to contact the Reservation Call Center there is a $25.00USD charge. If you must cancel a ticketed reward, doing so is allowed up to flight departure. The fee for cancellation is a payment of 3,000 ANA Mileage Club points. At 2.5 cents that is a reasonable $75.00 redeposit fee. Unused portions of a ticket that has initiated are non-refundable. All points expire 36 months from the date they were deposited in your account if not used. Tickets are valid to begin travel one year from the initial issuance. The validity period can not be extended under any circumstances. Other than for themselves, a member may only use reward points for family members. The family member must be registered with ANA Mileage Club before the ticket is issued. A member is limited to a maximum 10 family registrations. ANA reserves the right to request documentation proving the family relationship. Domestic partnerships are allowed in this group. The AFA program allows for families to earn miles individually and combine them for a single reward used by any family member. There is a separate registration program for this, only allowing up to 8 members. The same family hierarchy applies as described by ANA as "within 2 degrees of the primary member". Apparently the domestic partner is not allowed in this program. The cost to open the program is 1,000 ANA points and an additional 1,000 points is due if future changes are necessary. Mixed Seasons: On ANA flight when one of the legs falls within a different season, a point adjustment is made to reflect the true cost. The applicable season is based on the day of first fight departure for the origin/destination trip. So if the outbound flight departs in the regular season and a connecting flight to the destination departs in the high season, the regular season points are charged for that inbound/outbound side of the ticket. When inbound and outbound trips fall in two different seasons, the points required for each season are averaged to come up with a total trip cost. Transfers: A transfer is a connection flight that departs within 24 hours of the arrival time of the preceding flight. On ANA chart rewards you are allowed up to two transfers inside Japan on both inbound and outbound flights. The only restriction is you can't pass through a city twice. For example you couldn't land in Tokyo, connect to Osaka and return to Tokyo. On Partner chart rewards you are allowed up to two transfers in the originating country as well as up to two transfers inside Japan on both the inbound and outbound journeys. Let's say your journey is Phoenix to Fukuoka. The international flight leaves from a North American gateway city like San Francisco. You can have two connecting flights, Phoenix-LA-SanFran. Then once in Tokyo you can have two connections to your destination, Tokyo-Osaka-Fukuoka. From North America to Europe, Middle East and Africa you must go across the Atlantic. From North America to Japan, South Korea, Asia and Oceania you must go across the Pacific. In other words, you can't take Lufthansa from Chicago to Frankfurt to Tokyo even though it is a valid Star Alliance route you can procure with Mileage Plus, Aeroplan, LifeMiles and others. You can not transfer when the transfer city creates an itinerary that requires more points. For example, you can't go from Tokyo to Seoul to Los Angeles because the reward price from Seoul to LA is more than from Tokyo to Los Angeles. This example is also a valid Star Alliance route on Asiana Airlines available with other Star Alliance reward programs. Stopovers: A stopover is staying in a connection city for longer than 24 hours. Destinations are not stopovers. You are allowed a single stopover on either an ANA reward or Partner reward. The stopover can be taken on either the inbound or outbound trip. 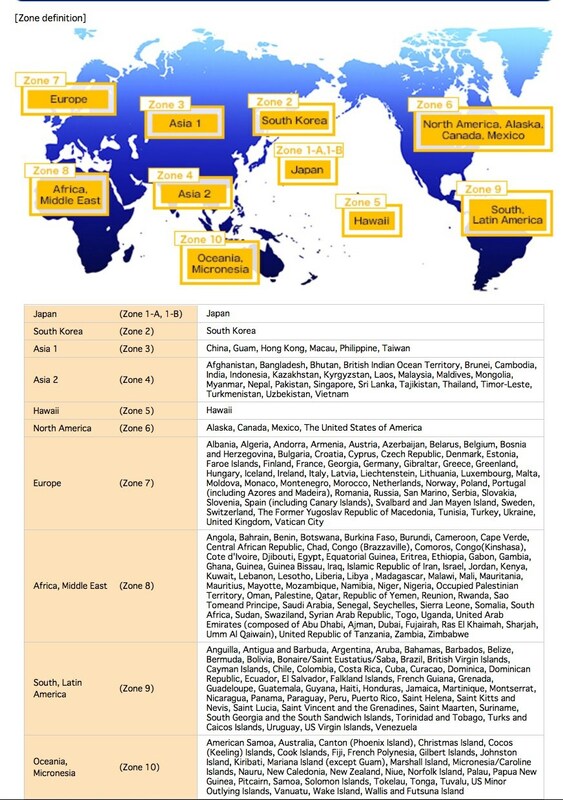 ANA reward tickets that originate from Japan are not allowed any stopovers. This Tokyo-Bangkok-Singapore is a valid Bangkok stopover for a Partner flight. Because it originates in Japan it is invalid for an ANA reward. However if reversed, Singapore to Tokyo it would be valid. The stopover in Bangkok can be either on the outbound or the inbound, not both. Hong Kong and China, and Hong Kong and Macau are different countries. Denmark, Norway and Sweden are considered one country. United States and Canada are the same country. Europe is the same country. Inter-trip open jaws. This is when your outbound arrival city and inbound departure city are different. Again some simple rules. Instead of countries you are restricted by areas. This example is an open jaw in Europe, arriving in Frankfurt and departing from Paris. Area 1: North America and Hawaii. Area 3 Japan, South Korea, Asia, Oceania. Multiple Tickets. You are allowed to hold multiple tickets within one ticket's itinerary. An example of this is you hold a round trip from Seattle to Tokyo. However when in Tokyo you hold a second ticket that takes you round trip to Singapore. You can mix classes inside itineraries. It can be done for an outbound or inbound flight or if there are multiple sectors on the inbound/outbound flights that can be booked in different classes. An average is used to determine the required number of points for the ticket. These examples show 2 classes inside the outbound/inbound as well as an actual ticket built on ANA's website using the "multi-class" option. One flight is in First the other in Business. Blackout dates: The only blackout dates are for January 1 and 2 from Tokyo to Hawaii in economy only. Once a ticket is issued, you can only change the dates or flights, not the routing or destination. You also can not change the passenger's name or carrier you are flying with. If a change results in a different season, points are adjusted accordingly. If more points are required and the account can not cover the increase then the change is denied. All changes must be made at least 24 hours before departure. Certain Partner reward classes are not available. Infants under 2 years old can fly on adult's lap by paying the infant fare. To occupy their own seat a full price reward ticket must be paid for, otherwise a child fare paid for the seat. Infants over 2 years old must either have a full adult fare reward ticket or purchase a discounted child fare. Searching for rewards on ANA's website is fairly straightforward. Even if you aren't planning on using Mileage Club points for flights, you can use the search engine to see if Singapore Airlines flights are in the Star Alliance inventory, as United and Air Canada don't show them. You must be an ANA Mileage Club member to search for rewards. Simply apply for the membership and you'll get a member number and set your password/pin. On the website home page is a flight reservation entry box. At the bottom is "Award Booking". Click to enter the search engine. It is here you will be prompted for your id and pin. Highlight the tabs "Award Reservation" and "Round trip". Enter the cities and dates. Make sure the "compare seat availability +/- 3 days" is checked to see a weeks worth of availability then click search. The subsequent screen will show what's available. If there is nothing you can use the -7d to go back a week or the +7d to go forward a week. Select the days you want to travel and move to the next screen. In this search both ANA flights and Star Alliance Partner flights are available. ANA flies direct between San Jose and Narita so that is the obvious choice. You can also see the difference is points, 75,000 to 90,000 as this is a "low" season trip. One important note: On Star Alliance Partner tickets, connections aren't necessarily in the class of service you select. This is a business ticket, but all the connections are in economy. Highlighting the Multiple Cities tab allows for the entry of up to 8 cities. You can use this even on a simple round trip where you want to go in one class and return in a different class. Or you can enter your allowed stopover using this screen. It can also be used to check for availability of round the world reward flights, but you can't book the actual ticket, you must call. Simply enter the dates and cities. The only issue with this search feature is if there is no reward availability for a date/city pair you enter for one of the legs, you have to return and start over. So if you have a complex itinerary, you might want to search for the individual legs and them combine them once availability is determined. Each destination will come up and you can select the flights you want and the class of service. Just make sure you are within the 24 hour transfer rule as it doesn't check that. If you select a connection flight past the 24 hours and already have a stop over you'll end up with an error. Actually it's not an error, just blank screen that doesn't tell you what you did wrong. The answer is an invalid route. In this example on the return that is what happened. The flight on 2/23 was past 24 hours, it allowed the selection but returned an error when done. Starting over I changed that day to 2/22 and was successful in building the itinerary. Here is the result. I had entered first class to Tokyo with a stopover for 6 days, first class to my destination of Bangkok. That's the inbound in First with a stopover. Then straight through business class Bangkok to Chicago as the outbound. Since I chose to fly Thai Airways this was a Partner reward. You can also use ANA's mobile app to search for rewards and it works great. Here is a sample of the same round trip San Jose to Narita as shown above. ANA's reward search tools are very good. Maybe not as complete as some other's like United, but for using Mileage Club points or searching for Singapore Star Alliance flights this is a great tool. ANA Mileage Club is the absolute best program to fly in any class of service to Japan now that they have removed the surcharges from North America fares. 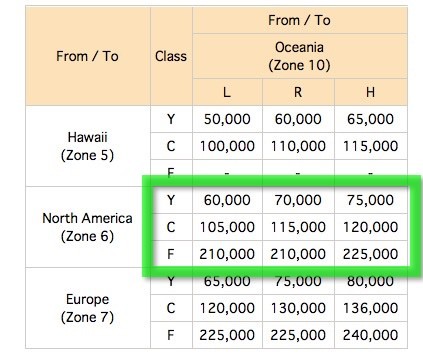 The "Low" season rates for business class equals what some other carriers charge for economy to Japan from North America. Even if you need to use the Star Alliance reward to get connections to the North American gateways, 90,000 points in business class round trip is a great deal. If Japan is your destination this program has to be considered. This is a comparison of a round trip from Chicago to Tokyo. #1 shows the flight on ANA aircraft for 75,000 ANA points plus $90.00. #3 is the same ANA aircraft booked on United for 150,000 MileagePlus points, double the points and $45.00 less cash. #2 is an option offered on ANA for a Star Alliance route from Chicago to Toronto to Tokyo on Air Canada for 90,000 points which is still really good if the direct ANA flight wasn't available. ANA charges a significant surcharge of $1,210 on this fare. So even charging 40,000 points less that what United Mileage Plus charges, the $1,210 surcharge converted to points at 2.5 cents, which is what you can buy them for, is 48,400 points making this a more expensive reward. This is a slightly more complicated comparison. The trip is on StarAlliance Partner Lufthansa from Chicago to Frankfurt in First Class. ANA requires 165,000 points and $975 in fees. United Mileage Plus charges 220,000 points and $144. That is a difference of 55,000 points and at 2.5 cents equals $1,375 or a $400 better fare. However if you can get United points at 2 cents, which they offer from time to time, then the UA fare is better by about $550. Note: While points are typically not paid for, they require an assigned value to understand their worth. In comparisons, instead of being subjective, Reward Flying uses the market value you can purchase these points for. Actual flight miles determine the required points for itinerary. Up to eight stopovers are allowed. Maximum 4 stopovers in Japan. Maximum 3 stopovers in Europe. Travel must be in one direction either eastbound or west bound. The final flight of the itinerary must be at least 10 days after the first flight. Reward can not be booked online. The total miles for this trip is 24,874. In business class the required number of ANA points would be 145,000. Surcharges were estimated at less than $500. This itinerary is only to 6 cities but it shows how lucrative the program is. It costs 140,000 points to go round trip North America to Europe on many program, and this is visiting Japan, Asia, Europe and South America! Upgrades are only allowed on international flights. In the event you have 2 international flights, e.g. LAX-NRT-BKK, you need separate upgrades for each sector. Upgrades are based on the distance of the the sector flown. For example, LAX to NRT is 5,451 miles. To upgrade from Economy to Business requires 25,000 points. JFK to NRT is 6,745 miles. To upgrade from Business class to First class you need 45,000 points. These are one way upgrades. Purchase, Purchase and Upgrade or Reward? While the thought of a "free" reward ticket is a great idea, they aren't free in terms of value. So it makes sense to maximize the value of your points. An examination of the fare to purchase, purchase down class and upgrade or just use the reward option provides the answer. Lowest restricted economy round trip ticket is $1,297 which does not allow for upgrades. Lowest restricted business round trip ticket is $3,090. Upgrade is 50,000 ANA points. If you purchase the Economy fare that can be upgraded you will lose $106 in value by not just purchasing the Business Class lowest fare. The Economy upgrade fare of $1,946, the 50,000 points at 2.5 cents each for $1,250 equals $3,196 and Business Class can be purchased outright for $3,090. If you want to sit in Economy the lowest fare is $1,267. A reward ticket is 50,000 points @ 2.5 cents is a wash (and not a good use of your points). If you spend 85,000 ANA points they are worth $2,125 for a $3,196 fare. You made $965 in value. Lowest Business Class fare is $3,689 which does not allow for upgrades. Lowest Business Class fare that allows for upgrades is $7,134. If you purchase the Business Class fare allowing the upgrade, it costs $7,134 plus 90,000 points whose value is $2,250 for a total of $9,384. That is about half the $18,843 First Class fare. If you just decided to sit in Business Class using 85,000 reward points you save $1,564. Or if you had enough points and spent the 150,000 as required the savings is a generous $15,093. You can earn ANA Mileage Club points on all Star Alliance Partners. Each carrier has their own valuations. You can find your airline here. ANA has a US branded credit card issued by the Bank of Omaha. It offers a meager 5,000 point bonus after a reasonable initial spend. It pays 2x points on ANA ticket purchases and 1 point per dollar on shopping and dining. SPG and Membership Rewards are transfer partners for ANA, making this program a viable reward program to use. Membership rewards is a 1:1 transfer while SPG is 1:1 with a 25% bonus on 20,000 point transfer increments. Plus there are Hotel transfer partners; IHG 5:1, Hilton 10:1, Hyatt 2.5:1, and Marriott ranging from 6.67:1 to 4:1. For a complete list use this link. ANA does not currently have a program that allows you to purchase points. However the transfer programs both allow point purchases. ANA Mileage Club program is a leading program, especially for travel to Japan. It is very inexpensive and ANA has a superior product. Their Round the World program is one of the better Star Alliance programs as well. The only drawback to the Mileage Club program are the surcharges. If you can avoid the surcharges you will not find a reward program that is less expensive.